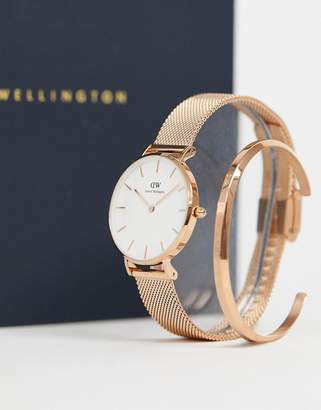 Watch gift set by Daniel Wellington, Gift it or treat yourself, Watch and bracelet set, Stainless-steel strap and case, Gold-tone finish, Two-hand movement, Dash indices, Single crown to side, Double-folding clasp, Branded cuff, Presented in a gift box. Daniel Wellington was a preppy power player, known for his impeccable style and his watches, of course. That's exactly why Swedish guy Filip Tysander named his line of watches after him. Think clean designs, NATO straps and a refined sense of colour. Impeccable, just like the man himself.